We may collect information about you when you register to become a member of the Website. In addition, we keep a record of the email addresses of those who communicate with us via our survey and newsletter. The information collected may include your name, address, telephone number, e-mail address, date of birth, gender, facts regarding your complaints. Lastly, we may collect information about you if you participate in any contest or promotion. The information collected may include your name, address, telephone number, email address, date of birth, and facts relevant to the contest or promotion participation. Generally, we will obtain the consent of individuals at the time personal information is collected or disclosed. You may withdraw your consent to the collection, use or disclosure of personal information at any time subject to any specific contractual provisions and the requirement to provide reasonable notice. We understand the importance of protecting your personal information and will do our best to implement safeguards to protect personal information against unauthorized access including the use of the latest Internet security protocols to protect personal information collected through the Website. 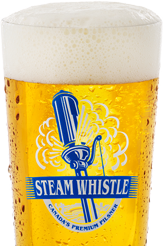 Steam Whistle Brewing uses your personal information for one or more of the following purposes: improve the content of the Website; personalize the content or layout of the Website for consumers; contact consumers for marketing purposes; process your consumer complaint or request. Disclosure of Personal Information Your personal information will not be used to place you on any mailing lists, except with your prior consent. Under no circumstances will we sell our customer lists, trade or rent your personal information to third parties.